There are days during which I truly enjoy spending time with Katherine and genuinely delight in her abilities and personality. Yesterday was not one of those. John and I have a system for days like yesterday. It amounts to me sending him a warning email about the state of the universie into which he is returning and holding down the fort until he gets home from work. Those of you with children know that there are some days when you make progress and there are others when you slip into first gear, what I call "maintenance mode". Simply put, in maintenance mode, no one dies through neglect or intent. John got home and I tagged out and ran. Grabbed my camera along the way and got me away from the little fiend of a…. Katherine and the dogs. 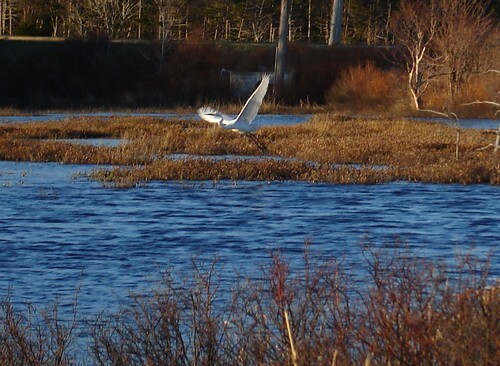 There has been a Great Egret hanging around the wetland behind Confederation Building for some time now. 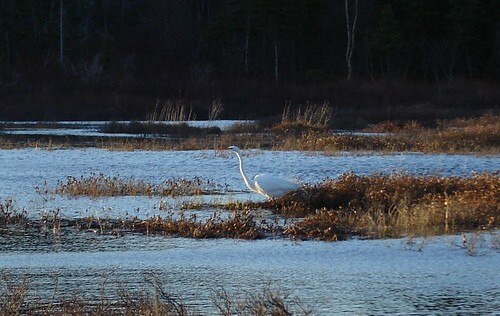 I've always loved Egrets and Herons and thought I'd take a gawk at the bird, if it was still there. It was and I managed a couple of nice photos. Could have used more optical zoom, but that's life. One of these years, when I have money, I'll get the telephoto for my camera which will almost triple my zoom. It'd still be cheaper than a new camera. Anyway, there were about half a dozen other photographers there. The truly hilarious parts were that I was the only woman and that all the guys had these huge…. telephoto lens and scarily expensive cameras. I often wonder when I see cameras like that, because I still firmly believe that, while a better camera can raise the bar on your photography, it's no substitute for a good eye and skilled composition. Still, I would have liked to have had one then. It was quite interesting to watch him (or her) fish. 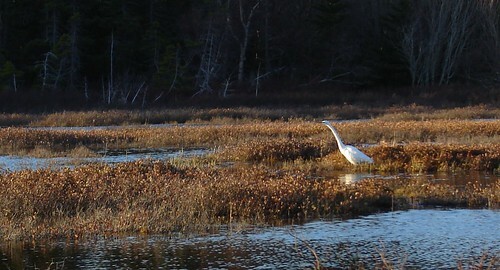 In the photo below, you can see its neck stretched out as it looks for fish in the water. 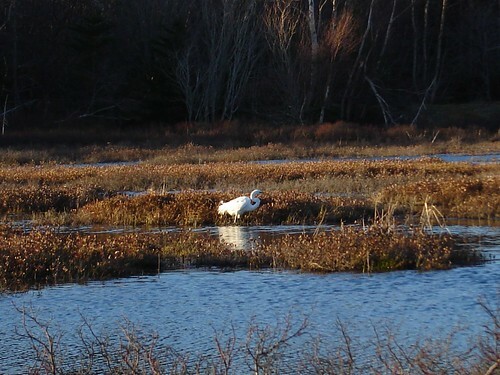 The shot below is of the bird wading through the shallows. The local bird watchers say that if the bird can find enough food, it will likely stick around for the summer and then resume its normal flight path come autumn. 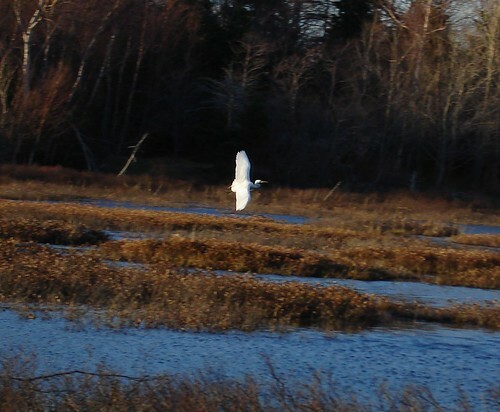 Some of the other photographers forgot that it was a wild bird and stomped around the marsh, looking for the right shot. 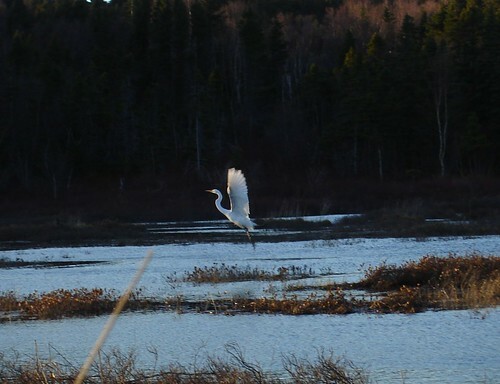 They startled the bird into the air and I caught this shot before it flew off to the far (and unnavigable) side of the bog. That’s got to be the fanciest way of saying “It’s not the size of the camera that matters, but the skill of the photographer wielding it” that I have ever heard. Bitstop has noted that there is an Osprey nest near St. John’s (Portugal Cove Road just past Old Broad Cove Road). It is nesting on a telephone pole by the side of the road. I forgive birds for being a bit flighty. The Great Blue Herons around here are smart enough to ignore cars passing, but if you stop they go on the alert, and if you open the door they are winging it away across the water. It is our job to be sneaky and smart enough to get close enough for a good shot. Someday I’ll do it (5X optical zoom just isn’t enough. I am in awe of your skills a photographer. You take the most wonderful pictures !